Saturday, 9 January 2016　All the seat are booked. The photo is from this year SBM Detox Seminar in Tokyo. Lily and Gold Tokyo will be held SBM Detox Seminar in Tokyo in January. I feel music knows no borders ! I had never played a string instrument before, actually my music, on the contrary I had a poor record in my music study when I was student. I still could not read a music note and I just follow a code of Ukulele. However,I always look up to someone who can play an instruments because I feel music knows no borders when I am away on a journey. So I wanted to learn some instrument somewhere in my mind. Since I started to practice I was not good student. 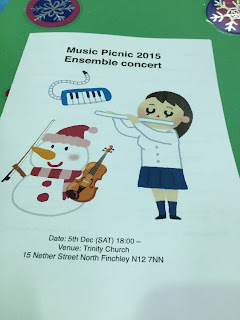 I decided to aim to join the December 5 Music picnic 2015 Ensemble concert which my tutor organized. I did not feel I would be ready to attend early of October. But it worked out last night! We played at local church. If you were only allowed to do one exercise to improve your health, what kind of exercise would you choose? If I were only allowed to do one exercise to improve the health of my mind and well balanced body I would choose Self Body Make (SBM). I started SBM when I was 38 years old. Here is my back grand of my heath condition. I went from hospital to hospital and I tried from complementary and alternative medicine to the next as well due to those condition. I was always looking for an easy exercise. I tried yoga and Pilates but neither of them really seemed to work. Yoga was good for relaxation but I never felt it was enough to reclaim my health. Meanwhile I met Mika. She checked my body and to my astonishment, her diagnoses were spot on. I wanted to aspire for a figure like Mika’s. That was one of the reasons why I chose SBM. Exercising on a daily basis was hard at first. My body was stiff and every time I attended classes I had muscle pains. But after a couple of months I was no longer suffering from period pain and back pain. My monthly menstrual cycle was becoming less of an agony. Symptoms of hay fever have also stopped since starting SBM. I no longer need facial masks to cover my nose during the season. Not only I was blessed with a baby but also I have toned incredibly, thanks to SBM. Many of my friends have been moaning how they cannot get rid of excessive fat around their stomachs after giving births; on the other hand my current weight is minus 2 to 3 kilos before I was pregnant. My belly is also toned and I look more slender than the time before I got pregnant. During my pregnancy I experienced neither back pain nor bloating and gained only 5 kilos despite indulging my favourite food to my heart content. I feel lucky and thankful for having such a smooth pregnancy period. I am exercising SBM while I take care of my young child. As I am busy attending to childcare, I cannot exercise as much as I would like to. However, I have been managing to do it every single day and for that reason alone, I am in good health. Because I toned rapidly after the childbirth, my dress size has gone down. I must say I am happy with that! I strongly recommend SBM to people who have been resorting to chiropractic treatment but can’t see the benefits of it, and to those who are on medication for headaches and/or period pains.